Mating Wool Carder bees on Lambs ears, note the larger size of the male. 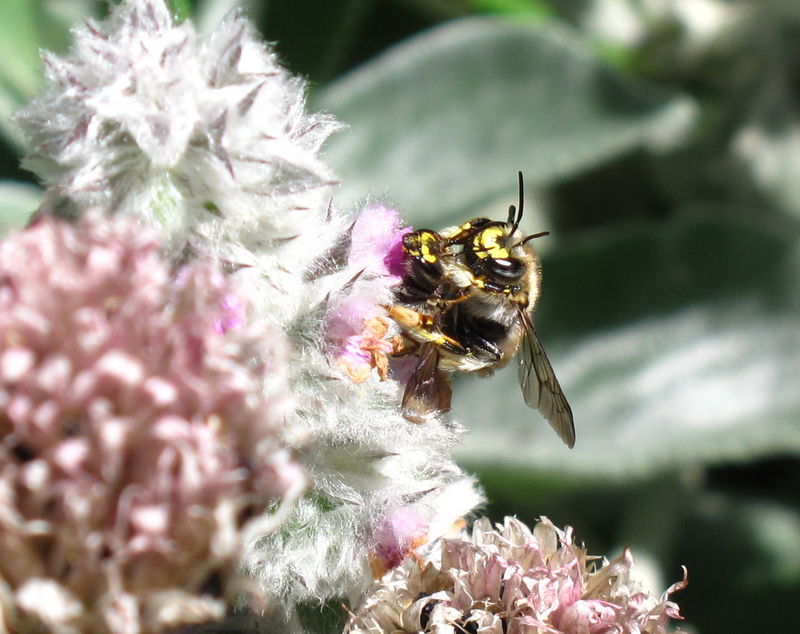 As I do with other bees, I have been recording the flowers the Wool Carder Bee visits and today I have compiled the results. As expected, the bee is most strongly associated with Lambs' Ears (43% of 89 records) on which the female collects hairs and both sexes feed and the male eagerly patrols; one in four of records is associated to Lavender (25%) and one in ten in Sage. Foxgloves make almost 5% of the remaining records. 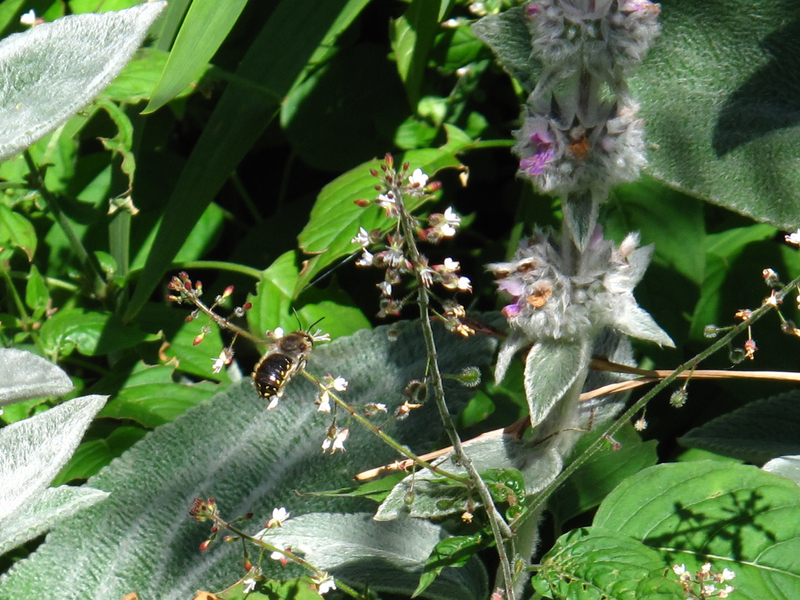 The rest of the species comprise 16% of the records and include Jerusalem sage (Phlomis), French Lavender (L. stoechas), Verbena bonairensis, Hedge Woundwort (Stachys sylvatica), Geranium, Sedum, Caryopteris, Purple toadflax (Linaria purpurea) and Lemon balm (Melissa officinalis). Of course, this is biased to the plants I grow in my garden, and I have reason to believe that other plants - or the minority plants - are favourites of this bee (for example Purple Toadflax and Stachys sylvatica, for which my observations are casual records in other places near home). This photo tries to show a typical male patrolling behaviour: he is hovering for a few seconds in front of a Stachys flower spike in search of females and intruders, then moving to the next spike and darting to the lavender patch he is also guarding. A male yesterday patrolling Lavender attacked in a few minutes Episyrphus balteatus, Bombus terrestris, Apis mellifera, and Megachile centuncularis, all of which were feeding on the lavender I also compiled the phenology of this species in Hull from my records and this is the occurrence graph, by fortnight and separate for males and females. 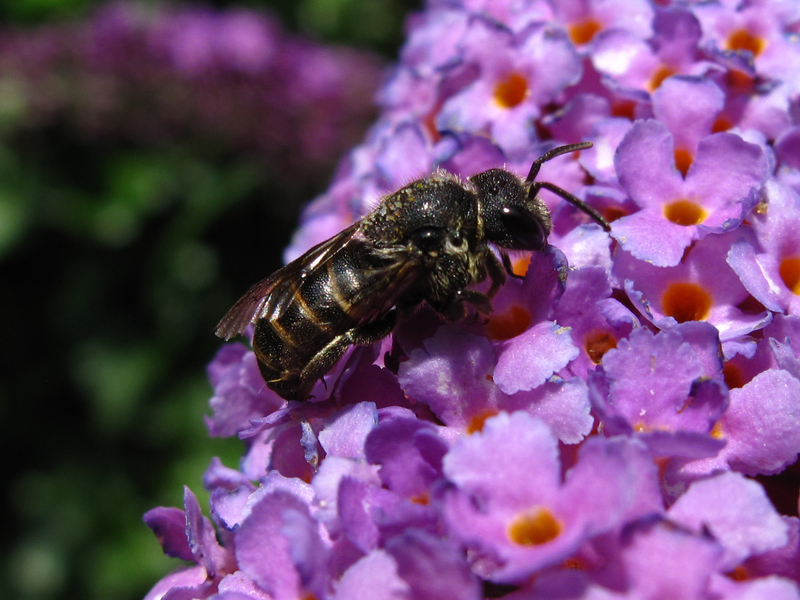 Finally, a couple of days ago, I took a photo of an unusual bee feeding on Buddleia. Stuart Roberts identified it for me in Wild about Britain as Stelis punctulatissima, the rare cuckoo be of the Wool Carder Bee. Most recods of this bee are from localities where the Wool Carder Bee is frequent. The photo is below.